Anti-satellite weapons (ASAT) are space weapons designed to incapacitate or destroy satellites for strategic military purposes. Several nations possess operational ASAT systems. Although no ASAT system has yet been utilised in warfare, a few nations have shot down their own satellites to demonstrate their ASAT capabilities in a show of force. Only the United States, Russia, China, and India have demonstrated this capability successfully. The development and design of anti-satellite weapons has followed a number of paths. The initial efforts by the US and the USSR were using ground-launched missiles from the 1950s; many more exotic proposals came afterwards. U.S. Vought ASM-135 ASAT missile launch on 13 September 1985, which destroyed P78-1. In the late 1950s, the U.S. Air Force started a series of advanced strategic missile projects under the designation Weapon System WS-199A. One of the projects studied under the 199A umbrella was Martin's Bold Orion air-launched ballistic missile (ALBM) for the B-47 Stratojet, based on the rocket motor from the Sergeant missile. Twelve test launches were carried out between 26 May 1958 and 13 October 1959, but these were generally unsuccessful and further work as an ALBM ended. The system was then modified with the addition of an Altair upper stage to create an anti-satellite weapon with a 1770-kilometre (1100 mi) range. Only one test flight of the anti-satellite mission was carried out, making a mock attack on the Explorer 6 at an altitude of 251 km (156 mi). To record its flight path, the Bold Orion transmitted telemetry to the ground, ejected flares to aid visual tracking, and was continuously tracked by radar. The missile successfully passed within 6.4 km (4 mi) of the satellite, which would be suitable for use with a nuclear weapon, but useless for conventional warheads. The use of high altitude nuclear explosions to destroy satellites was considered after the tests of the first conventional missile systems in the 1960s. During the Hardtack Teak test in 1958 observers noted the damaging effects of the electromagnetic pulse (EMP) caused by the explosions on electronic equipment, and during the Starfish Prime test in 1962 the EMP from a 1.4-megaton-of-TNT (5.9 PJ) warhead detonated over the Pacific damaged three satellites and also disrupted power transmission and communications across the Pacific. Further testing of weapons effects was carried out under the DOMINIC I series. An adapted version of the nuclear armed Nike Zeus was used for an ASAT from 1962. Codenamed Mudflap, the missile was designated DM-15S and a single missile was deployed at the Kwajalein atoll until 1966 when the project was ended in favour of the USAF Thor-based Program 437 ASAT which was operational until 6 March 1975. ASATs were generally given low priority until 1982, when information about a successful USSR program became widely known in the west. A "crash program" followed, which developed into the Vought ASM-135 ASAT, based on the AGM-69 SRAM with an Altair upper stage. The system was carried on a modified F-15 Eagle that carried the missile directly under the central line of the plane. The F-15's guidance system was modified for the mission and provided new directional cuing through the pilot's head-up display, and allowed for mid-course updates via a data link. The first launch of the new anti-satellite missile took place in January 1984. The first, and only, successful interception was on 13 September 1985. The F-15 took off from Edwards Air Force Base, climbed to 11613 m (38100 ft) and vertically launched the missile at the Solwind P78-1, a U.S. gamma ray spectroscopy satellite orbiting at 555 km (345 mi), which was launched in 1979. Although successful, the program was cancelled in 1988. On 21 February 2008, the U.S. Navy destroyed the malfunctioning U.S. spy satellite USA-193 using a ship-fired RIM-161 Standard Missile 3. The origins of the Soviet anti-satellite weapon program are unclear. According to some accounts, Sergei Korolev started some work on the concept in 1956 at his OKB-1, while others attribute the work to Vladimir Chelomei's OKB-52 around 1959. What is certain is that at the beginning of April 1960, Nikita Khrushchev held a meeting at his summer residence in Crimea, discussing an array of defence industry issues. Here, Chelomei outlined his rocket and spacecraft program, and received a go-ahead to start development of the UR-200 rocket, one of its many roles being the launcher for his anti-satellite project. The decision to start work on the weapon was made in March 1961 as the Istrebitel Sputnik (IS) (lit. "fighter satellite"). The IS system was "co-orbital", approaching its target over time and then exploding a shrapnel warhead close enough to kill it. 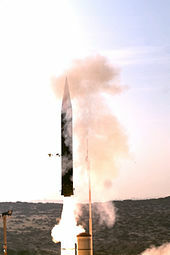 The missile was launched when a target satellite's ground track rises above the launch site. Once the satellite is detected, the missile is launched into orbit close to the targeted satellite. It takes 90 to 200 minutes (or one to two orbits) for the missile interceptor to get close enough to its target. The missile is guided by an on-board radar. The interceptor, which weighs 1400 kg (3086 lb), may be effective up to one kilometre from a target. Delays in the UR-200 missile program prompted Chelomei to request R-7 rockets for prototype testing of the IS. Two such tests were carried out on 1 November 1963 and 12 April 1964. Later in the year Khrushchev cancelled the UR-200 in favour of the R-36, forcing the IS to switch to this launcher, whose space launcher version was developed as the Tsyklon-2. Delays in that program led to the introduction of a simpler version, the 2A, which launched its first IS test on 27 October 1967, and a second on 28 April 1968. Further tests carried out against a special target spacecraft, the DS-P1-M, which recorded hits by the IS warhead's shrapnel. A total of 23 launches have been identified as being part of the IS test series. The system was declared operational in February 1973. The world's first successful intercept was completed in February 1970 The first successful test (the second overall) achieved 32 hits (each could penetrate 100 mm of armour). Testing resumed in 1976 as a result of the U.S. work on the Space Shuttle. Elements within the Soviet space industry convinced Leonid Brezhnev that the Shuttle was a single-orbit weapon that would be launched from Vandenberg Air Force Base, manoeuvre to avoid existing anti-ballistic missile sites, bomb Moscow in a first strike, and then land. Although the Soviet military was aware these claims were false, Brezhnev believed them and ordered a resumption of IS testing along with a Shuttle of their own. As part of this work the IS system was expanded to allow attacks at higher altitudes and was declared operational in this new arrangement on 1 July 1979. However, in 1983, Yuri Andropov ended all IS testing and all attempts to resume it failed. Ironically, it was at about this point that the U.S. started its own testing in response to the Soviet program. The Soviet Union also experimented with large, ground-based ASAT lasers from the 1970s onward (see Terra-3), with a number of U.S. spy-satellites reportedly being "blinded" (temporarily) during the 1970s and 1980s. The USSR had also researched directed energy weapons, under the Fon project from 1976, but the technical requirements needed of the high-powered gas dynamic lasers and neutral or charged particle beam systems seemed to be beyond reach. In the early 1980s, the Soviet Union also started developing a counterpart to the U.S. air-launched ASAT system, using modified MiG-31D 'Foxhounds' (at least six of which were completed) as the launch platform. System was called 30P6 "Kontakt", the missile used is 79M6. The USSR also experimented with Almaz military space stations, arming them with fixed Rikhter R-23 auto-cannons. One last Soviet design worth mentioning is 11F19DM Skif-DM/Polyus, an orbital battle station with a megawatt-range laser that failed on launch in 1987. In 1987, Mikhail Gorbachev visited Baikonur Cosmodrome and was shown an anti-satellite system called "Naryad" (Sentry), also known as 14F11, launched by UR-100N rockets. After the Soviet Union collapsed, there were proposals to use this aircraft[clarification needed] as a launch platform for lofting commercial and science packages into orbit. Recent political developments (see below) may have seen the reactivation of the Russian Air-Launched ASAT program, although there is no confirmation of this as yet. The Strategic Defense Initiative gave the US and Soviet ASAT programs a major boost; ASAT projects were adapted for ABM use and the reverse was also true. The initial US plan was to use the already-developed MHV as the basis for a space based constellation of about 40 platforms deploying up to 1,500 kinetic interceptors. By 1988 the US project had evolved into an extended four-stage development. The initial stage would consist of the Brilliant Pebbles defense system, a satellite constellation of 4,600 kinetic interceptors (KE ASAT) of 45 kg (100 lb) each in Low Earth orbit and their associated tracking systems. The next stage would deploy the larger platforms and the following phases would include the laser and charged particle beam weapons that would be developed by that time from existing projects such as MIRACL. The first stage was intended to be completed by 2000 at a cost of around $125 billion. At 22:28 UTC on 11 January 2007, the People's Republic of China successfully destroyed a defunct Chinese weather satellite, FY-1C. The destruction was reportedly carried out by an SC-19 ASAT missile with a kinetic kill warhead similar in concept to the American Exoatmospheric Kill Vehicle. FY-1C was a weather satellite orbiting Earth in polar orbit at an altitude of about 865 km (537 mi), with a mass of about 750 kg (1650 lb). Launched in 1999, it was the fourth satellite in the Feng Yun series. The missile was launched from a mobile Transporter-Erector-Launcher (TEL) vehicle at Xichang (28°14′49″N 102°01′30″E﻿ / ﻿28.247°N 102.025°E﻿ / 28.247; 102.025﻿ (Xichang Satellite Launch Center)) and the warhead destroyed the satellite in a head-on collision at an extremely high relative velocity. Evidence suggests that the same SC-19 system was also tested in 2005, 2006, 2010, and 2013, although none of those events created any long-lived orbital debris. In May 2013, the Chinese government announced the launch of a suborbital rocket carrying a scientific payload to study the upper ionosphere. However, U.S. government sources described it as the first test of a new ground-based ASAT system. An open source analysis, based in part on commercial satellite imagery, found that it may indeed have been a test of a new ASAT system that could potentially threaten U.S. satellites in geostationary Earth orbit. Similarly on 5 February 2018, China tested an exoatmospheric ballistic missile with the potential to be used as an ASAT weapon, the Dong Neng-3, with state media reporting that the test was purely defensive and it achieved its desired objectives. USA-193 was an American reconnaissance satellite, which was launched on 14 December 2006 by a Delta II rocket, from Vandenberg Air Force Base. It was reported about a month after launch that the satellite had failed. In January 2008, it was noted that the satellite was decaying from orbit at a rate of 500 m (1640 ft) per day. On 14 February 2008, it was reported that the United States Navy had been instructed to fire an RIM-161 Standard Missile 3 ABM weapon at it, to act as an anti-satellite weapon. According to the U.S. government, the primary reason for destroying the satellite was the approximately 450 kg (1000 lb) of toxic hydrazine fuel contained on board, which could pose health risks to persons in the immediate vicinity of the crash site should any significant amount survive the re-entry. On 20 February 2008, it was announced that the launch was carried out successfully and an explosion was observed consistent with the destruction of the hydrazine fuel tank. The successful flight test of Russia’s direct ascent anti-satellite missile, known as PL-19 Nudol, took place 18 November 2015, according to defence officials familiar with reports of the test. In May 2016, Russia tested the Nudol for the second time. It was launched from the Plesetsk cosmodrome test launch facility, located 805 kilometres (500 mi) north of Moscow. Three more launches were reportedly held in December 2016, on 26 March 2018, and on 23 December 2018—the latter two from a TEL. A new type of ASAT missile was seen carried by a MiG-31 in September 2018. In April 2012, DRDO's chairman V. K. Saraswat said that India possessed the critical technologies for an ASAT weapon from radars and interceptors developed for Indian Ballistic Missile Defence Programme. In July 2012, Ajay Lele, an Institute for Defence Studies and Analyses fellow, wrote that an ASAT test would bolster India's position if an international regime to control the proliferation of ASATs similar to NPT were to be established. He suggested that a low-orbit test against a purpose-launched satellite would not be seen as irresponsible. The programme was sanctioned in 2017. On 27 March 2019, India announced the successful launch of the India's first ASAT. The interceptor was able to strike a test satellite at a 300-kilometre (186 mi) altitude in low earth orbit (LEO), thus successfully testing its ASAT missile. The interceptor was launched at around 05:40 UTC at the Integrated Test Range (ITR) in Chandipur, Odisha and hit its target Microsat-R after 168 seconds. The operation was named Mission Shakti. The missile system was developed by the Defence Research and Development Organisation (DRDO)—a research wing of the Indian defence services. With this test, India became the fourth nation with anti-satellite missile capabilities. India stated that this capability is a deterrent and is not directed against any nation. In a statement released after the test, Indian Ministry of External Affairs said that the test was conducted at low altitude to ensure that the resulting debris would "decay and fall back onto the Earth within weeks". According to Jonathan McDowell, an astrophysicist at Harvard–Smithsonian Center for Astrophysics, some debris might persist for a year, but most should burn up in the atmosphere within several weeks. Brian Weeden of Secure World Foundation agreed, but warned about the possibility of some fragments getting boosted to higher orbits. US Air Force Space Command said that it was tracking 270 pieces of debris from the test. Following the test, acting United States Secretary of Defense Patrick Shanahan warned about the risks of space debris caused by ASAT tests, but later added that he did not expect debris from the Indian test to last. The United States Department of State acknowledged Ministry of External Affairs' statement on space debris and reiterated its intention to pursue shared interests in space including on space security with India. Russia acknowledged India's statement on the test not being targeted against any nation and invited India to join the Russian–Chinese proposal for a treaty against weaponisation of space. While it has been suggested that a country intercepting the satellites of another country in a conflict, namely between China and the United States, could seriously hinder the latter's military operations, the ease of shooting down orbiting satellites and their effects on operations has been questioned. Although satellites have been successfully intercepted at low orbiting altitudes, the tracking of military satellites for a length of time could be complicated by defensive measures like inclination changes. Depending on the level of tracking capabilities, the interceptor would have to pre-determine the point of impact while compensating for the satellite's lateral movement and the time for the interceptor to climb and move; U.S. intelligence, surveillance and reconnaissance (ISR) satellites orbit at about 800 km (500 mi) high and move at 7.5 km/s (4.7 mi/s), so a Chinese Intermediate-range ballistic missile would need to compensate for 1350 km (840 mi) of movement in the three minutes it takes to boost to that altitude. Even if an ISR satellite is knocked out, the U.S. possesses an extensive array of manned and unmanned ISR aircraft that could perform missions at standoff ranges from Chinese land-based air defences, making them somewhat higher priority targets that would consume fewer resources to better engage. The Global Positioning System and communications satellites orbit at higher altitudes of 20000 km (12000 mi) and 36000 km (22000 mi) respectively, putting them out of range of solid-fuelled Intercontinental ballistic missiles. Liquid-fuelled space launch vehicles could reach those altitudes, but they are more time-consuming to launch and could be attacked on the ground before being able to launch in rapid succession. The constellation of 30 GPS satellites provides redundancy where at least four satellites can be received in six orbital planes at any one time, so an attacker would need to disable at least six satellites to disrupt the network. Even if this is achieved, signal degradation only lasts for 95 minutes, leaving little time to take much decisive action, and backup inertial navigation systems (INS) would still be available for relatively accurate movement as well as laser guidance for weapons targeting. For communications, the Naval Telecommunications System (NTS) used by the U.S. Navy uses three elements: tactical communications among a battle group; long-haul communications between shore-based forward Naval Communications Stations (NAVCOMSTAs) and deployed afloat units; and strategic communication connecting NAVCOMSTAs with National Command Authorities (NCA). The first two elements use line-of-sight (25–30 km (13–16 nmi; 16–19 mi)) and extended line-of-sight (300–500 km (160–270 nmi; 190–310 mi)) radios respectively, so only strategic communications are dependent on satellites. China would prefer to cut off deployed units from each other and then negotiate with the NCA to have the battle group withdraw or stand down, but ASATs could only achieve the opposite. Even if somehow a communications satellite were hit, a battle group could still perform its missions in the absence of direct guidance from the NCA. The Arrow 3 or Hetz 3 is an anti-ballistic missile, currently in service. It provides exo-atmospheric interception of ballistic missiles. It is also believed (by experts such as Prof. Yitzhak Ben Yisrael, chairman of the Israel Space Agency), that it will operate as an ASAT. In a televised press briefing during the 97th Indian Science Congress in Thiruvananthapuram, the Defence Research and Development Organisation Director General Rupesh announced that India was developing the necessary technology that could be combined to produce a weapon to destroy enemy satellites in orbit. On 10 February 2010, Defence Research and Development Organisation Director-General and Scientific Advisor to the Defence Minister, Dr. Vijay Kumar Saraswat stated that India had "all the building blocks necessary" to integrate an anti-satellite weapon to neutralize hostile satellites in low earth and polar orbits. India is known to have been developing an exo-atmospheric kill vehicle that can be integrated with the missile to engage satellites. [unreliable source?] 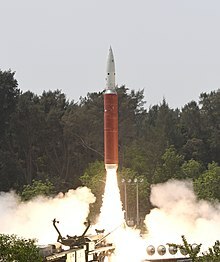 On 27 March 2019, India tested its ASAT missile (Mission Shakti) destroying a pre-determined target of a defunct satellite. The DRDO's ballistic missile defence interceptor was used on an Indian satellite for the test. Microsat-R is the suspected target of the Indian ASAT experiment. ^ "WS-199". Designation-systems.net. Archived from the original on 15 December 2010. Retrieved 29 December 2007. ^ Grier, Peter. "The Flying Tomato Can." Archived 20 November 2012 at the Wayback Machine Air Force magazine, February 2009. Retrieved: 9 February 2013. ^ Kestenbaum, David (19 January 2007). "Chinese missile destroys satellite in 500 mile orbit". NPR. Archived from the original on 22 February 2011. Retrieved 2 April 2018. ^ "Исторические сведения "Истребитель спутников" – программа". Army.lv. Archived from the original on 9 October 2016. Retrieved 7 October 2016. ^ "Сезон космической охоты (крылатые ракеты, противоспуниковая система ИС). Смотреть онлайн. История России" [Season of space hunting (cruise missiles, anti-satellite IP system). Watch online. Russian history]. Statehistory.ru. Archived from the original on 9 October 2016. Retrieved 7 October 2016. ^ Podvig, Pavel. "Did Star Wars Help End the Cold War? Soviet Response tothe SDI Program" (PDF). Scienceandglobalsecurity.org. Archived (PDF) from the original on 6 December 2018. Retrieved 6 December 2018. ^ Voukadinov, Tyler Rogoway and Ivan. "Exclusive: Russian MiG-31 Foxhound Carrying Huge Mystery Missile Emerges Near Moscow". Thedrive.com. Archived from the original on 4 February 2019. Retrieved 3 February 2019. ^ "Naryad anti-satellite system (14F11)". Russianspaceweb.com. Archived from the original on 5 February 2012. Retrieved 21 January 2019. ^ The Heritage Foundation. Archived 4 March 2016 at the Wayback Machine. Accessed 21 January 2012. ^ "China silent on satellite killer". Beijing. AFP. 18 January 2007. Archived from the original on 10 February 2007. ^ "Anti-satellite Tests in Space - The Case of China" (PDF). Secure World Foundation. 16 August 2013. Archived (PDF) from the original on 2 August 2014. ^ "China once again high-altitude scientific exploration test: height higher data more". China News Network. 14 May 2013. Archived from the original on 10 August 2014. ^ Shalal-Esa, Andrea (15 May 2013). "U.S. sees China launch as test of anti-satellite muscle: source". Reuters. Archived from the original on 24 September 2015. ^ Weeden, Brian (17 March 2014). "Through a Glass, Darkly: Chinese, American, and Russian Anti-satellite Testing in Space" (PDF). Secure World Foundation. Archived (PDF) from the original on 3 September 2014. ^ Panda, Ankit. "Revealed: The Details of China's Latest Hit-To-Kill Interceptor Test". The Diplomat. Archived from the original on 9 February 2019. Retrieved 7 February 2019. ^ "U.S. plans for falling satellite". CNN. 30 January 2008. Archived from the original on 31 January 2008. ^ "Navy missile hits dying spy satellite, says Pentagon". Cnn.com. 21 February 2008. Archived from the original on 25 February 2008. Retrieved 20 February 2008. ^ "US shoots down toxic satellite". The Daily Telegraph. Sydney. 20 February 2008. Archived from the original on 22 December 2008. Retrieved 20 February 2008 – via news.com.au. ^ "Russia Flight Tests Anti-Satellite Missile". Freebeacon.com. 2 December 2015. Archived from the original on 4 December 2015. Retrieved 2 December 2015. ^ "Russia Flight Tests Anti-Satellite Missile". Freebeacon.com. 27 May 2016. Archived from the original on 27 June 2016. Retrieved 23 June 2016. ^ Podvig, Pavel (2 April 2018). "Successful Nudol ASAT test reported". Russian Strategic Nuclear Forces. Archived from the original on 18 November 2018. Retrieved 21 January 2019 – via russianforces.org. ^ Sheetz, Amanda Macias, Michael (18 January 2019). "Russia succeeds in mobile anti-satellite missile test: US intelligence report". Cnbc.com. Archived from the original on 20 January 2019. Retrieved 21 January 2019. ^ "Russia to field new anti-satellites missiles for MiG-31 interceptor already soon – New Russian weapons". PravdaReport.com. 26 October 2018. Archived from the original on 2 December 2018. Retrieved 21 January 2019. ^ Mizokami, Kyle (1 October 2018). "Russia's MiG-31 Spotted With Possible Anti-Satellite Missile". Popularmechanics.com. Archived from the original on 2 December 2018. Retrieved 21 January 2019. ^ Unnithan, Sandeep (27 April 2012). ""India has all the building blocks for an anti-satellite capability"". India Today. Archived from the original on 27 March 2019. Retrieved 27 March 2019. ^ Lele, Ajay (11 July 2012). "Should India Conduct an ASAT Test Now?". idsa.in. Institue for Defence Studies and Analyses. ^ "Anti-satellite missile project was given clearance 2 years back: DRDO chief". Hindustan Times. Press Trust of India. 27 March 2019. ^ Solanki, Lalit (27 March 2019). "India Enters the Elite Club: Successfully Shot Down Low Orbit Satellite". The Mirk. Retrieved 28 March 2019. ^ "India says space debris from anti-satellite test to 'vanish' in 45..." Reuters. 28 March 2019. Retrieved 28 March 2019. ^ "Explained Mission Shakti | What is A-SAT and how it hit Microsat-R in 168 secs". OnManorama. Retrieved 28 March 2019. ^ "India shows off tech to 'kill' satellites, will also help tackle high-altitude missiles". The Times of India. Retrieved 27 March 2019. ^ "Press Information Bureau". pib.nic.in. Retrieved 27 March 2019. ^ Harsh Vasani. "India's Anti-Satellite Weapons". Thediplomat.com. Archived from the original on 1 January 2018. Retrieved 27 March 2019. ^ "India successfully tests anti-satellite weapon: Modi". Theweek.in. ^ "U.S. says studying India anti-satellite weapons test, warns on debris". Reuters. 27 March 2019. Retrieved 27 March 2019. ^ "Frequently Asked Questions on Mission Shakti, India's Anti-Satellite Missile test conducted on 27 March 2019". www.mea.gov.in. Retrieved 27 March 2019. ^ Salazar, Doris Elin (28 March 2019). "India Says Its Anti-Satellite Weapon Test Created Minimal Space Debris. Is That True?". Space.com. Retrieved 17 April 2019. ^ Clark, Stephen (27 March 2019). "U.S. military sensors track debris from Indian anti-satellite test". Spaceflight Now. ^ Stewart, Phil (28 March 2019). "U.S. studying India anti-satellite weapons test, warns of space debris". Reuters. ^ Stewart, Phil (28 March 2019). "U.S. sees India space debris from weapons test eventually burning up". Reuters. ^ "US adopts neutral stand on 'Mssion Shakti', to continue space collaboration with India". The Hindu Business Line. 28 March 2019. ^ Chaudhury, Dipanjan Roy (29 March 2019). "Russia puts onus on US for early outer space rules after India's test". The Economic Times. ^ Opall-Rome, Barbara (9 November 2009). "Israeli experts: Arrow-3 could be adapted for anti-satellite role" (PDF). Imaginova SpaceNews.com: 16. Retrieved 9 November 2011. [permanent dead link] See also full article: #1 Archived 20 December 2011 at the Wayback Machine (2010-03-04). ^ Foust, Jeff (27 March 2019). "India Tests Anti-Satellite Weapon". Space.com. ^ Jackson, Paul, ed. (1998). Jane's: All the World's Aircraft: 1998–99. Surrey: Jane's. p. 386. ISBN 0710617887. ^ "USSR/CIS Miniature ASAT". Globalsecurity.org. Archived from the original on 10 May 2011. Retrieved 26 April 2010. ^ "Is Russia ready for Star Wars? | Features & Opinion | RIA Novosti". En.rian.ru. Archived from the original on 16 August 2009. Retrieved 17 November 2012. ^ Sputnik. "Russia to revamp air-space defenses by 2020 – Air Force chief". En.rian.ru. Archived from the original on 14 August 2009. Retrieved 12 August 2009. ^ "Russian officer says developing new weapon for space defense". En.rian.ru. Archived from the original on 18 May 2010. Retrieved 17 May 2010. ^ Podvig, Pavel (13 November 2012). "Russia to resume work on airborne laser ASAT". Russianforces.org. Archived from the original on 20 April 2013. Retrieved 17 November 2012.